Not too long ago, I stumbled on a site that I really enjoyed reading. 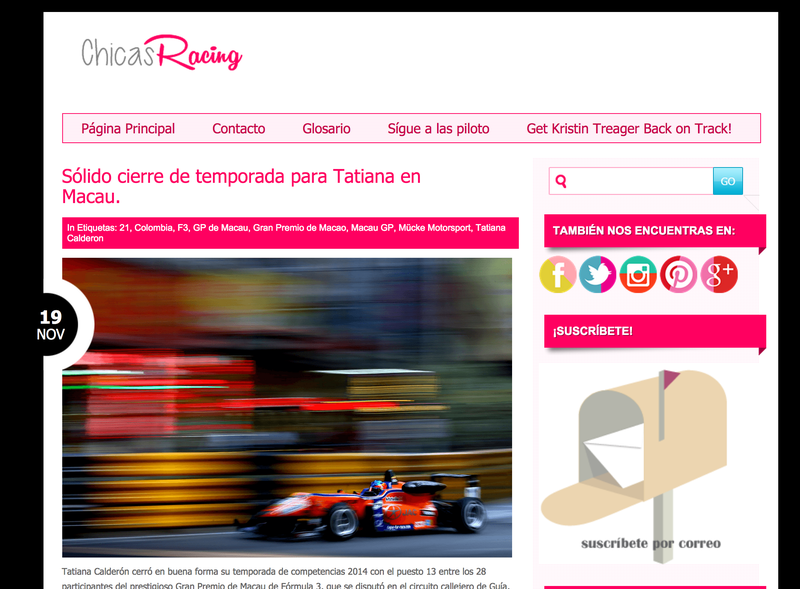 Chicas Racing, a women’s racing site in spanish language based out of Mexico. 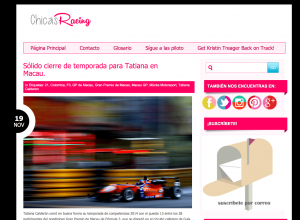 What Horsepower & Heels hopes to accomplish in the english-speaking community, Chicas Racing is doing for the spanish-speaking demographic. The site features a wide variety of different racers from every different genre of motorsport. They regularly feature news for rising young talent, as well as report on all the professional women tearing up the racetracks. which in english translates that she was inspired to create a blog because of mine. That is one of the biggest compliments that anyone could ever offer me. It means that my passion and dedication to supporting women in motorsports has made a difference for someone, and that the passion will continue to be spread around the world. Sharing with the world the stories of the many thousand women and young girls out there showing that they are strong, capable, and talented drivers is so important to ALL women in motorsports. Over the years, there have been only a handful of news sources that share and champion this message to the masses. But the more we grow in telling our stories, the more the world has to celebrate the successes and fight through the hardships with us. So for my latinos, please stop by and check out Chicas Racing! Dígales que Horsepower & Heels le envió.